It’s football season, and more importantly, it’s Ohio State Buckeye football season. And the Mahoning Valley Burger Review Board (MVBRB) stopped in to the Buckeye Diner (Boardman) to rate the Buckeye burgers. Do you see a theme here? Buckeye Diner caters to the Buckeye fan. Adorned in Ohio State decorations; pictures of Ohio State players all over the walls; and a giant big screen TV above the counter so you can watch every minute of every game. The burgers even have the Ohio State moniker: the Buckeye burger (1/2 lb burger with lettuce, tomato and mayo); the Brutus burger (1 lb burger with lettuce, tomato and mayo). You can get cheese, mushrooms and bacon for an extra cost and all the burgers come with fries. 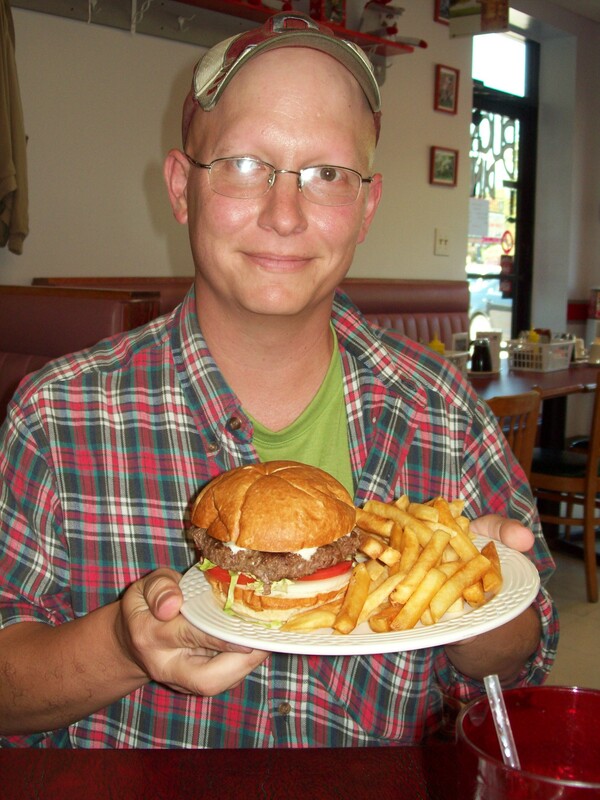 The Diner also offers a challenge burger – the Buckeye Belly Buster. It is not for the faint of stomach, boasting 3 1-lb burgers with all the fixings, a side of fries, a side of chili and a salad. With more than enough food to feed a family of four, no one has yet to conquer the Belly Buster. Buckeye Diner was opened in 2009 by Randy and Ngan Wiley, wanting to serve “just basic, good, home cooked food with large portions and low prices.” They also offer specials all day from breakfast to lunch to dinner. Also, a special feature for the diner is the homemade pies, which are baked fresh daily. We placed our burger orders and looked around at all the Ohio State memorabilia, especially the pictures of all the famous Ohio State football players. We all ordered the Buckeye burger and were pleased with the 1/2 pound of seasoned beef; fresh toppings, and the burger-filling bun. The thick, crispy fries accompanying the burgers did taste good. It was a decent burger, but didn’t bowl us over. The main problem we had was that we were the only three people in the diner at the time, and it took 45 minutes for our burgers to arrive. And, other than taking our order and being presented with the bill, those were the only two times we spoke to our waitress. She did pass by on two occassions to go outside for a smoke break, but we had no drink refill offers during our dining experience. Hopefully this was just a one-time happening and is not reflective of their everyday business. Under different circumstances, this could be a very good place for a Buckeye fan to sit back, order a Buckeye burger and watch an Ohio State victory. The portions were very generous, but the long wait, and lack of service took away from what might of been a better burger.